Quick and easy watermelon salad recipe, made in one pot with simple ingredients. 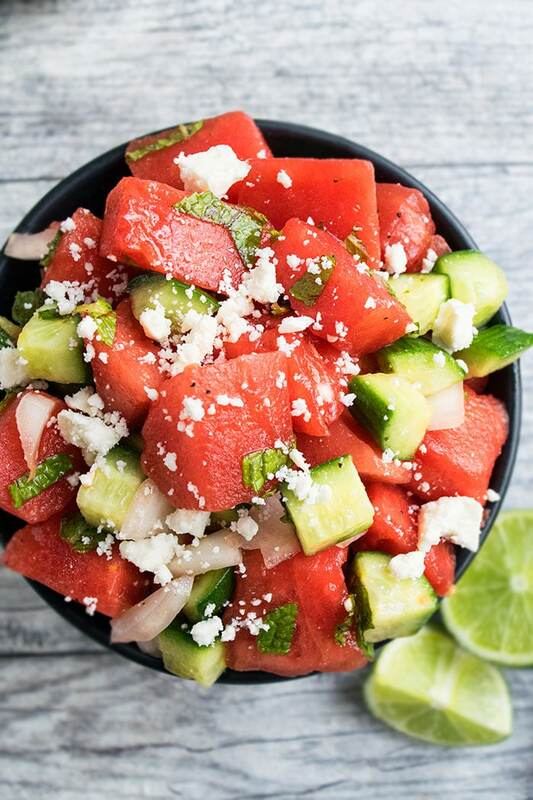 Ready in 15 minutes, Loaded with watermelon, cucumbers, onion, mint, feta! 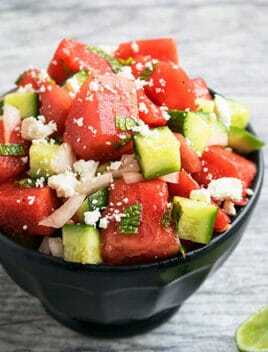 The best watermelon salad I ever had was at a small Greek restaurant on one of my travels. It was so juicy and slightly sweet and salty with a hint of minty freshness. Now, this recipe for watermelon salad with red onion and feta is not identical to that one but it comes VERY close. Cool down with this Summer watermelon cucumber salad! 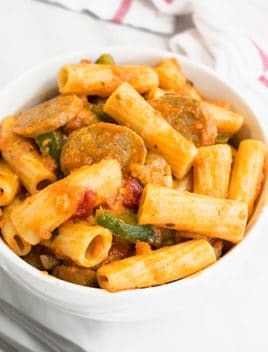 The fruits and vegetables, used in this recipe help you beat the Summer heat and makes a great side dish. Keep it simple with just olive oil, honey, lemon juice, salt, pepper, fresh mint and basil. Fresh mint takes this watermelon mint salad over the top! Fresh mint always rocks this recipe rather than using dried mint. The flavor is fresher and mush stronger but not overwhelming. Grilled watermelon salad– Grill watermelon slices first and then use that in the salad. Tomato watermelon salad– Add 1 cup of cherry tomatoes in this salad. The sweeter, the better. Arugula watermelon salad– Add 2 cups of roughly chopped arugula in this salad. Balsamic watermelon salad– Drizzle balsamic glaze on top of this salad, prior to serving. Basil watermelon salad– Replace mint with fresh basil. Cilantro watermelon salad– Replace mint with fresh cilantro. 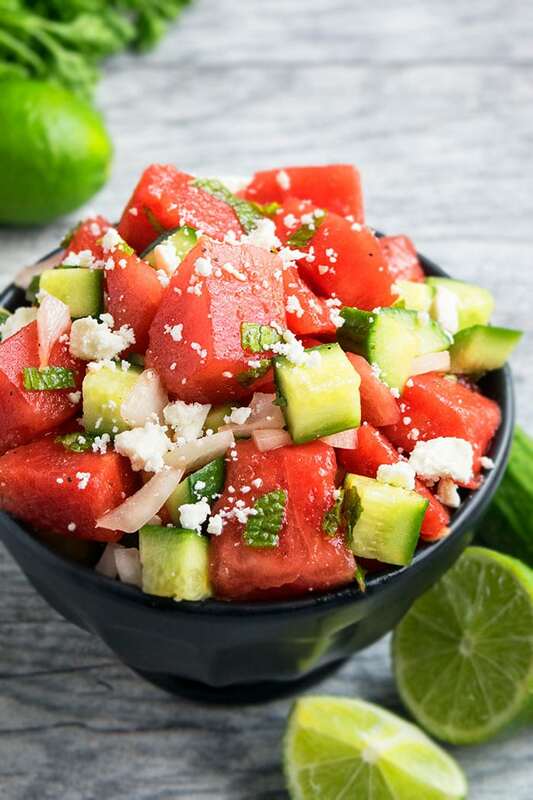 How to make Greek watermelon salad recipe? 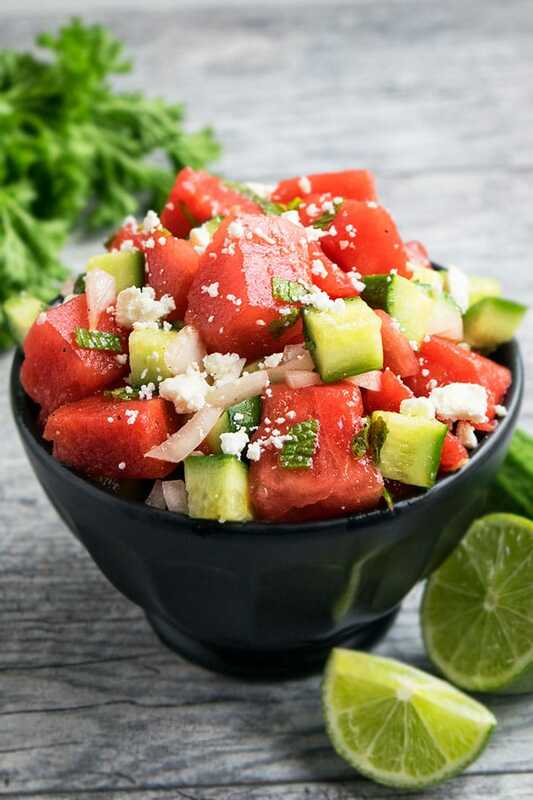 In a large mixing bowl or salad, bowl, toss together watermelon pieces, onion slices, cucumbers, basil, mint, olive oil, lime juice, salt, pepper, garlic powder, honey. Top it off with feta cheese and you are done. Use a very ripe watermelon for maximum juiciness and flavor. 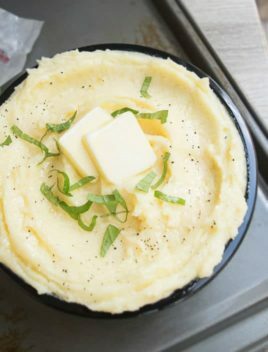 Adjust the amount of feta cheese, based on your preference. Don’t use any other cheese beside feta because it gives the best Greek/ Mediterranean flavor. Add more or less onions, based on your preference. I don’t add a lot because its strong flavor can over-power all the other flavors in this salad. 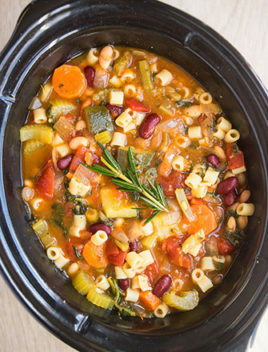 Use whatever fresh herbs you like. I used basil and mint. Make sure they are fresh for best overall flavor. Lemon juice can be used instead of lime juice. 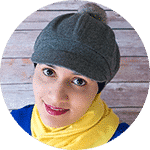 In a large salad bowl, add watermelon, cucumber, onion, mint, basil, oil, lemon juice, honey, salt, pepper, garlic powder, honey and mix until everything is combined properly. 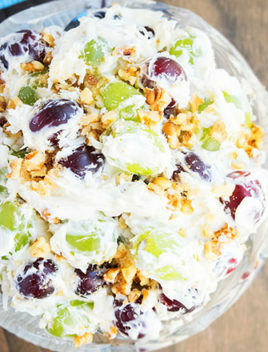 Sprinkle feta cheese on top and enjoy.